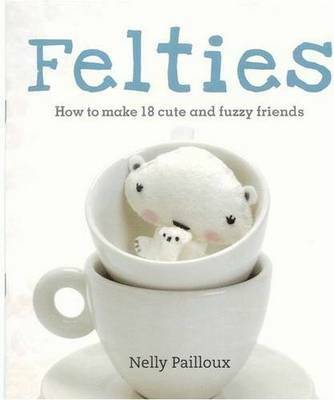 Hot on the heels of the little crochet creatures that are amigurumi come felties: just as adorable, and probably even easier to make, but crafted from felt rather than yarn. They're very tiny, so they can be pressed into practical service as key rings or cell phone mascots. Despite their size, these have a soupcon of sophistication as well as simplicity-theiry're definitely not child's play. "The Felite Pacl" gives you all the materials you need (felt in lots of colours; beads and sequins; needles; embroidery thread, and stuffing) to make three of these tiny characters: Polaroo, the polar bear who carries her baby with her in a pouch; Babushka, the traditional Russian doll embellished with folk-art embroidery, and Samurai Cat, who wears his elaborate costume with truly Japanese flair. The book in the pack also contains illustrated steps and instructions for making 11 of their friends. There's something therapeutic about making these diminutive characters and adding the minute features that make up their very distinctive personalities: you may well find that not only are you hooked on making the whole menagerie, but that you also start to invent some unique feltie people of your own.